Celtic kept their triple treble quest firmly on course as they swept nine-man Aberdeen aside 3-0 to book a place in next month's William Hill Scottish Cup final. Odsonne Edouard's penalty and precise finish from substitute Tom Rogic rubbed salt into Pittodrie wounds as the Reds also had Lewis Ferguson sent off. 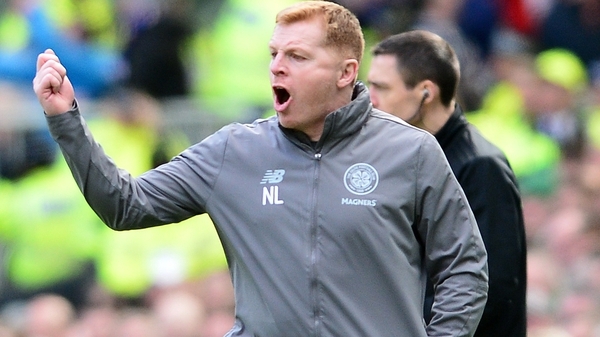 Hoops interim boss Neil Lennon will now look to boost his chances of landing the post permanently by wrapping up the club's third straight domestic clean sweep when they take on final opponents Hearts on May 25. But within seconds the game took a major swing in Celtic's favour as Ball got his marching orders. Already on a booking for a trip on Forrest, he was shown a second after his head cracked against the cheek of his former Pittodrie team-mate Christie in a sickening collision. Aberdeen's reaction to the restart was quicker and they almost snatched the lead as Ferguson headed wide. Aberdeen's day went from bad to worse on 67 minutes as Ferguson was next to go after diving in to Rogic with a disgraceful two-footed lunge.